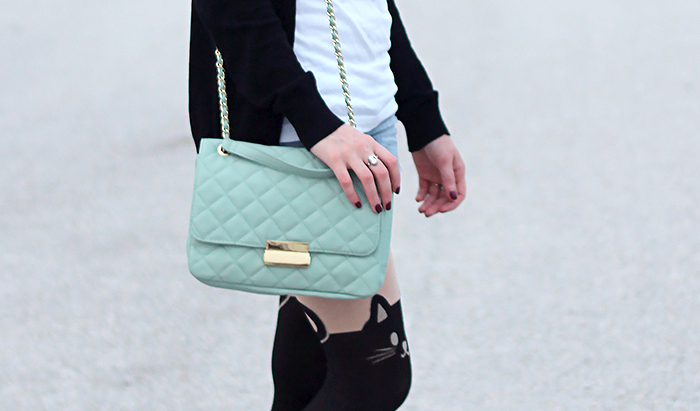 Cat tights and mint accessories - can't think of a better combination. I wore this outfit to go shopping with my sister and somebody asked me if they were tattoos. I love me some cats, but I would never, ever get solid black cats tattooed on my legs. You shouldn't either. Tattoo cats? Oh geez, I just about lost it. Loving those shorts! I haven't been to Bluenotes in ages. Im not a big fan of cats but I love these tights! I love how you styled them too! Haha I know, I was kind of taken aback at how stupid that question was. Le sigh. Oh, cat tattoos are awesome. Solid black tattoos that go all the way up your leg like that is a bit strange though....can you imagine how expensive that would be!? hhaha, not to mention painful. It hurts even to think about it! Hahah who would ever get such tattoos?! But I really do love those tights, they're so cute and I agree there's nothing to not like about cats and mint accessories! I think you just convinced me that I officially need some of those tights! these tights are just way too adorable! cracking up that someone thought they were tattoos, i mean...come on! bahaha, that would be the most painful bought of tattooing ever! Those are the cutest tights! We just stopped by to say hello. We're Dorco, a manufacturer of high quality shaving systems, cartridges and disposable razors for men and women, and our razors cost up to 75% less than leading brands. But that doesn't mean you have to sacrifice the quality of your shave. Our razors are crafted with the highest quality blades and lubricating strips containing moisturizing ingredients like aloe and vitamin E to soothe and hydrate even the most sensitive skin. But don't take our word for it--read what others think about our products and our prices at DorcoUSA.com. Thanks for hearing us out and for sharing these lovely look with us! I keep seeing these tights. I love love love them. I just must get them. Arg.